July 29, 2014: The New Mockingjay Trailer Is Here! July 29, 2014 Conversation Starters: You Guys! The New Mockingjay Trailer Is Here And It Is Awesome! + More! 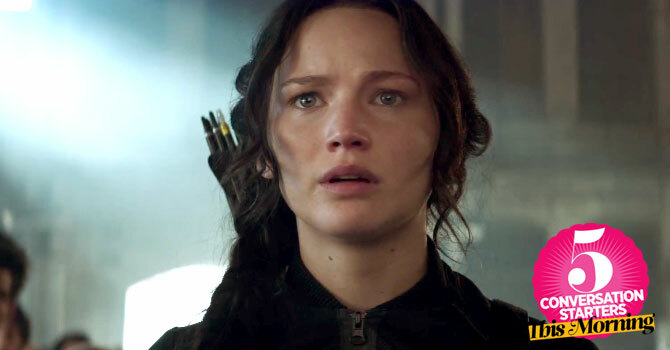 1 We're not going to lie: The Hunger Games: Mockingjay Part 1 trailer gave us SERIOUS goosebumps! The teaser looks darker, edgier, and a whole lot scarier. The late Phillip Seymour Hoffman returns as Plutarch Heavensbee, Liam Hemsworth as Gale Hawthorne, and yep, that's a silver-haired Julianne Moore as Alma Coin and Game of Thrones actress Natalie Dormer as Cressida.